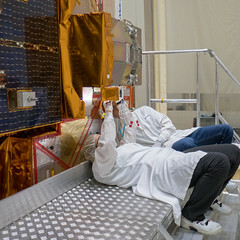 Find below a detailed timeline for the launch of Sentinel-1A on 3 April 2014. Lift off is set for 21:02:31 GMT (23:02:31 CEST) on board Soyuz ST flight VS07 from Europe’s Spaceport in Kourou, French Guyana. This is a ‘real-time’ activity and all times are subject to change. Follow the launch live online via the Arianespace webcast (20:40 GMT/22:40 CEST start) or watch the ESA launch event live from ESOC (19:30 GMT/21:30 CEST start). CEST until launch is wrong (-2h instead of +2h). I hope it was not written by a project software engineer :o.